What’s the most important thing to bring on an off-road adventure? Wrong. It’s a sense of humor. And, maybe, a willingness to have a plan B... through Z. 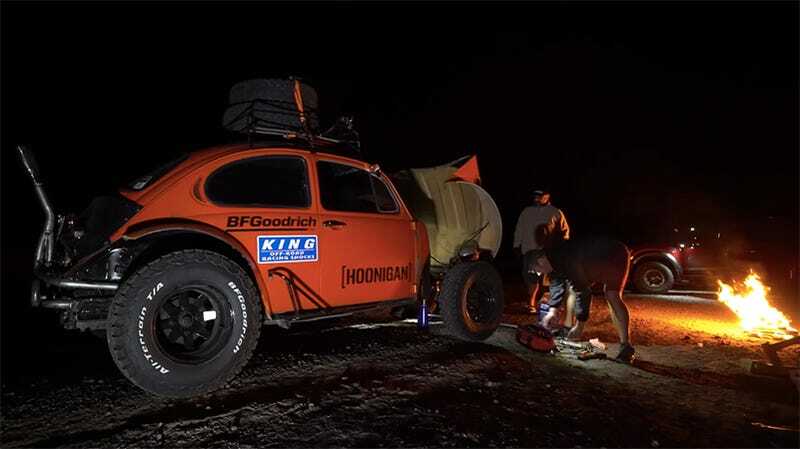 The Long Beach-based band of rascals known as The Hoonigans found “the cheapest Baja Bug on Craigslist,” or whatever corner of California this orange automotive insect was lurking in, cleaned it up (kind of) and sent it on down the Baja peninsula to chase the 50th Baja 1000. Did they keep up with the race cars? Maybe! Who knows. Regardless, it looks like they had a pretty good time. At one point a dude hands them a set of remote-reservoir King shocks. I mentioned that everyone loves a Baja Bug, right? Everyone loves a Baja Bug. If you’re into this thing and are wondering how such a glorious off-road machine could be had so cheaply, here’s a deeper dive into how grubby it is. But a bright-orange Bug is the best kind of beater. Especially when you have a BF Goodrich tire sponsorship and a week to burn south of the border.